Click play to see how easily Walker Strategy Associates creates customized Workday training content. The sample outputs below were all produced from a single recording of Workday and can be updated and maintained just as easily. Click to see a simulation of how to change a team member’s business title in Workday in a new browser window. Simulations are used for demonstrations and practice. Click to try an interactive simulation of changing a team member’s title in a new browser window. Interactive simulations are used for practice. Follow the instructions in the yellow bubbles. 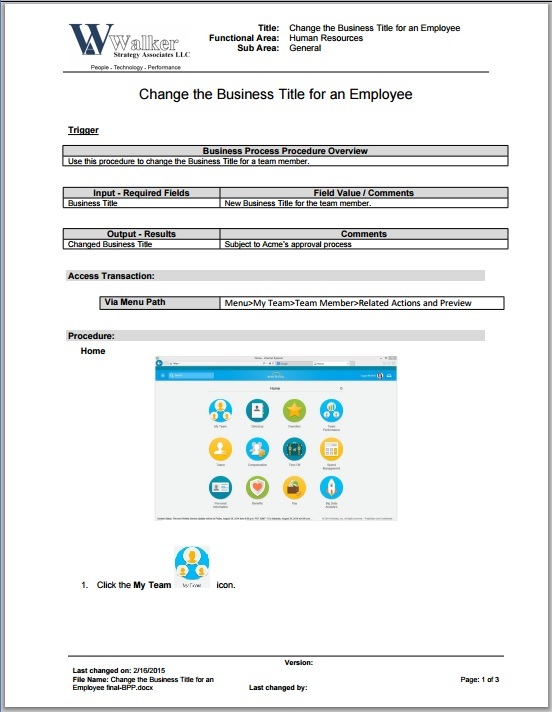 Click the image below to view a step-by-step procedure for changing a team member’s title in Workday in a new browser tab. WSA is the exclusive representative in the Workday market for Epilogue Systems’ innovative performance support product for rapid content development, management and delivery. Author allows a training developer to produce step-by-step procedures and simulations simply by executing a transaction (business process action) in Workday. WSA also makes content available to end users directly from Workday. We create and publish content to the entire end user population easily. Help, available directly at the point of need, greatly enhances the users’ ability to perform.